If you want to have your kitchen cleaned from top to bottom by a certified professional using professional tools and supplies, you are in the right place. We take pride in our kitchen cleaning services in Kensington, SW7 and are certain that our packages will be perfect for you. We not only have competitive prices, but also great offers. We work with enthusiasm, we are spry and efficient. We have cleaned many kitchens and facilities. We know best how to get rid of stains and take care of the place. Leave your kitchen in our hands. We will tend to it. Be sure to call us right away. The cleaning is focused on one room, that’s why it makes sense to include all the surfaces. Our kitchen cleaning service in SW7 encompasses hard-reaching areas, nooks and crannies, common areas and everything in between. In a word, we tackle everything we see and even those areas we don’t. We are really good at kitchen cleaning. We are specialists at cleaning kitchen surfaces like worktops, appliances and islands. We also clean drawers, pantries, floors, sinks, corners, lamps, light switches, skirting boards and cabinets. We have a very good cleaning programme, which we established a long while ago. It is tried-and-tested. We can assure you that our kitchen cleaning service is very worthwhile. 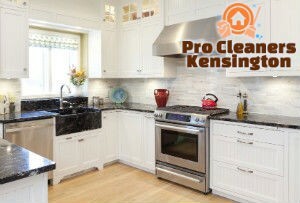 We collaborate with our clients in order to make our kitchen cleaning service in Kensington the best. We usually ask our clients what they expect from our service. We want to know whether they have any particular requests in mind or whether they just need the whole kitchen tackled. We then carry out a cleaning programme. Don’t worry, we will clean all of the surfaces for you. You will be amazed. We spend as many hours as necessary on the job. We will never leave your side until your kitchen has been cleaned to perfection. You have our word. Call us today.